So, as I mentioned in an earlier post, I’m learning to see while on maternity leave. I’m so chuffed to be able to report that I’ve finished my first project! I made a pair of pyjamas, which was the first clothing project in the brilliant book, Love at First Stitch, by Tilly Walden. Tilly’s project only covered the pyjama bottoms (“Margot” pyjamas/lounge trousers) so I made up the pyjama top using a very popular blouse pattern called “Sorbetto”, by Colette patterns. I’ve been working on them for just over a month but that’s mainly because I don’t often have time to sit down with my hands baby-free and do something other than eat/shower/sleep! If I was child free or Baby Boy was sleeping through the night then I reckon I could have knocked these up in less than a week. I did the last bit of work on these between 3am and 6am last night, having decided not to go back to sleep after Baby Boy’s feed. I was planning to do a nice photo shoot involving me in my new PJs reading a magazine after a few hours of sleep, but as you will see, I can’t do that yet, so I’ll just share with you a photo that I took when I tried on my finished PJs and decided to just wear them to bed. So, I happily skipped off to bed feeling very proud of myself at 6am. At 8.30ish, Baby Boy woke up for a feed. 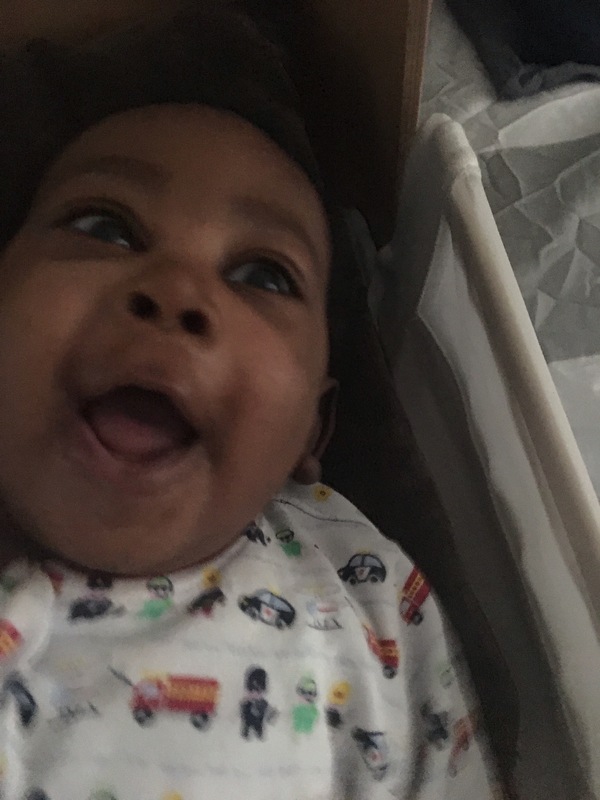 By 9am he was awake, changed, cleaned, fed and we were downstairs making ga-ga faces at each other when out of nowhere he did one of those coughs that turn into a burp and accidentally trigger an avalanche of vomit. All over the PJs I slaved over during spare minutes I carved out mainly in the dead of night for over a month. I couldn’t face waiting any longer to do this blog post so I just abandoned the idea of the cute reveal picture and decided to use what I have. Hence the rather underwhelming photos, but there they are, my home sewn pjs! I really enjoyed the experience and learned loads – they didn’t come out 100% perfect but I’d still give myself an A and happily wear them. And now I know how to do better on clothes I’ll actually wear outside the house! 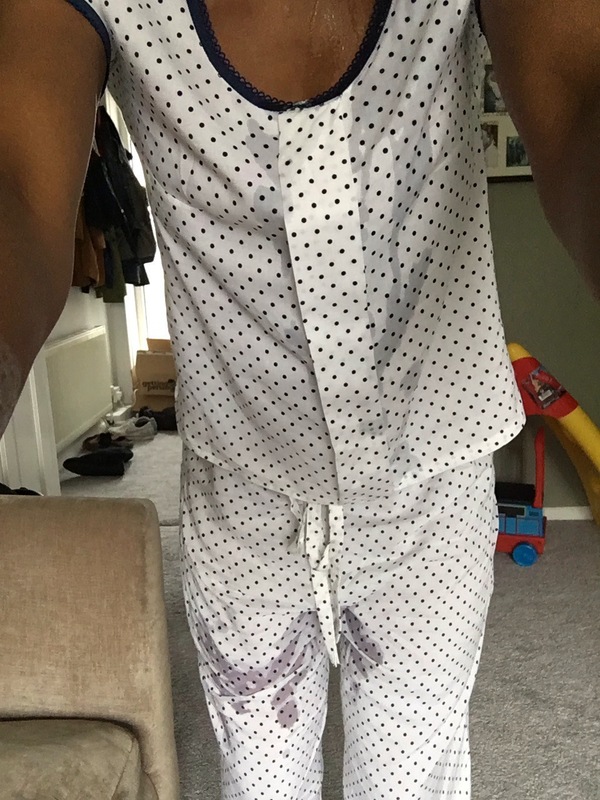 (I also now know that polycotton is probably a bit light for my loungewear/PJs especially while I’m at risk of being vomited on every day – but hey it’s what the fabric shop man had, as he didn’t have any of the recommended fabrics!). Ease of use: 5/5. The book, Love at First Stitch, is beautifully illustrated and well laid out. The pattern was pre-printed and the instructions made perfect sense. Well pitched for beginners. Style: 5/5. I love the length of the trousers and their loose flowing fit from the hips down. Fit: 4/5. My waist and hip measurements came out as different pattern sizes so, as Tilly instructed, I used the larger of the two, which was actually from the waist measurement. In the end, the hips fit fine but the waist is very loose. That said, there’s a drawstring so it’s not a big deal. Cost: included in the book, which cost £20. Optional changes: I added in-seam side pockets following the instructions from the next project in the book. Because they weren’t part of the pattern I had to guess where to place them, and have ended up putting them too far down, but you live and you learn! I’m also planning to change the drawstring to an elastic ribbon since the waist is so loose. Ease of use: 4/5. My first time using digital patterns, I found it a bit of a faff, but not prohibitively complicated. Only 16 sheets of A4 to trim and stick together, could have been worse! Style: 5/5. Other than the fact that I find it a bit short, I think the Sorbetto has a lovely classic look. I imagine it in silk for a nice, simple office blouse, and I’ve seen people’s blogs where they’ve inverted the pleat or replaced it with other design features and it all looked good. I’ll just lengthen it by a couple of inches for future use. Fit: 4/5. I find it a bit loose but it has to be since it goes over the head with no pesky fastenings to worry about. I’d probably take it in a bit and make a version with a side zip at down point, for a nice blouse. Optional changes: I was feeling brave and inspired, having finished the Margot trousers successfully, so I used the sleeve pattern generously provided for free as a digital pattern, here, on the Sew Incidentally blog. I had to take about an inch and a half off each end of the sleeve pattern to get a sleeve fit with no gathers. I used a basic polycotton that I got from a fabric shop near me, which I think was under £3/meter. They didn’t have lawn/viscose/ any of the recommended fabrics for the Margot pattern. The neck/sleeve binding is a pretty trimmed bias binding I got on eBay here, £5.49 for 5 meters which will cover multiple projects. I must say I’m really looking forward to my next project now! Penny for your thoughts: What was your first sewing project, if you sew? Any easy projects you’d recommend for a beginner? I like your review style, Over on Kings Drive. Very authentic :). Would love to feature your reviews in our weekly curated email digest that goes out to thousands of people. Thanks Elissa, glad you enjoyed it! ← 10 things my wardrobe told me..